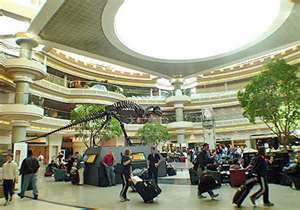 Considered the world’s busiest airport, Atlanta is a gateway for many international destinations and now it’s even more welcoming for visitors either leaving or arriving via Atlanta’s Hartsfield-Jackson International Airport. airport since the Maynard H. Jackson terminal opened on May 16. The Maynard H. Jackson International Terminal opened Wednesday, May 16, 2012, at the airport. In addition to adding 12 new gates exclusively for international flights, the $1.4 billion dollar terminal will simplify the process of arriving in Atlanta as international travelers will not be required to re-check their luggage after clearing customs. The Maynard H. Jackson International Terminal is part of a $5.4 billion development program which will expand, repair and upgrade designated areas within the airport’s facilities. Passengers aboard Delta Flight 177 from Dublin, Ireland, were the first to arrive at the international terminal’s 12-gate Concourse F. The first departure from the 1.2 million-square-foot facility was Delta Air Lines Flight 295 to Tokyo, Japan. Positioned at the apex of Europe and Latin America, Atlanta is a hub of international flight. Already direct flights to 165 destinations in Central and South America, as well as 115 destinations in Europe are offered through the airport. With a new international terminal, Atlanta can accommodate even more international flights. “The Maynard H. Jackson International Terminal will take advantage of Atlanta’s geographical advantages to capture additional international visitation,” said William Pate, president and CEO of Atlanta Convention & Visitors Bureau. The opening of the new terminal coincides with a push from the United States to increase international visitation. Brand USA, a $200 million marketing campaign designed to attract international travelers, has the potential to bring an additional $859 billion in economic output to the U.S by 2020. Over the next five years, overseas visitation to the United States is expected to rise 54 percent. Information courtesy of Atlanta Convention and Visitors Bureau. Photo courtesy of Bing free photos.